There are a number of important points to this case. 1) The patient is known to be chronically neutropenic because of myelodysplasia. Myelodysplasia results in varying degrees of pancytopenia due to a clonal bone marrow malignancy. Patients are at risk of transformation to acute myeloid leukaemia. It is essential that patients presenting with symptoms or signs of sepsis and are known, or at risk of neutropenia that they are treated with appropriate antibiotics immediately. Haemolysis can have a number of causes. This has been looked into in case 17 (https://teamhaem.wordpress.com/2013/12/02/case-17-summary/). A recent transfusion should prompt towards a delayed transfusion reaction. In addition the direct antiglobulin test was positive (See http://upload.wikimedia.org/wikipedia/commons/thumb/1/1c/Coombs_test_schematic.png/641px-Coombs_test_schematic.png. Delayed transfusion reactions occur in patients who have developed allo-antibodies as a result of previous sensitisation to foreign red blood cell antigens. During pregnancy or blood transfusion foreign red cells enter the circulation. These foreign red cells have foreign proteins called antigens that are capable of producing an antibody response. An antibody is an immunoglobulin (IgG, IgM, IgA etc.) capable of ‘attacking’ antigen. These antibodies lay ‘dormant’ until the antigen once again appears – either through repeated transfusion or if they are IgG can pass through the placenta affecting the foetus. The most important antigens which are matched for in the transfusion lab are ABO antigens and the Rh D antigen. There are many other antigens that are not matched for as they are not normally significant, especially as the vast majority of patients are only transfused as a one off occasion. It is recommended that people who are anticipated to receive regular transfusions are given much more closely matched blood as their exposure to foreign red cell antigens is greater and thus are at higher risk of developing antibodies. 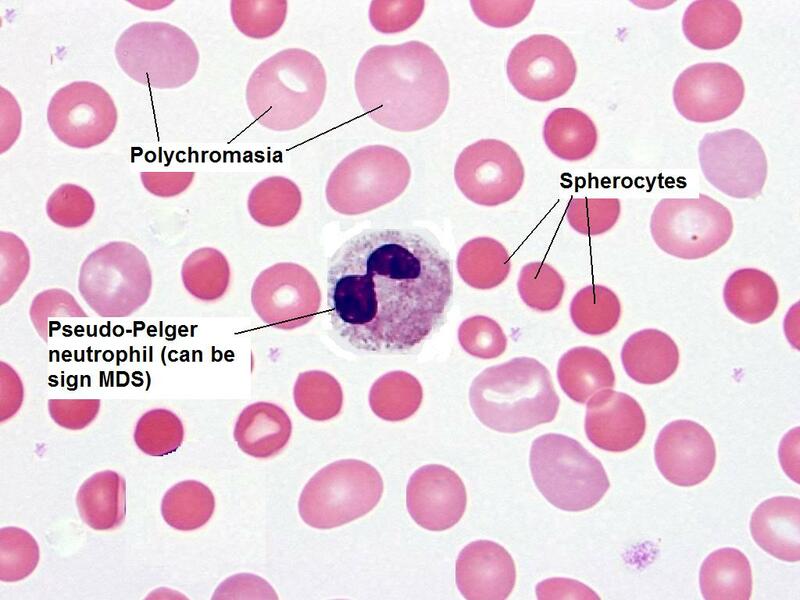 Patients with MDS and congenital anaemias (e.g. sickle cell) fall into this group. Some hospitals also try to match women of child-bearing age more closely due to risk of any antibodies forming being passed onto the foetus, which may cause haemolytic disease of the newborn. In our case it is likely that a previous transfusion has caused an antibody response and this antibody has been at low levels so wasn’t detected in the initial group and antibody screen when she was transfused a week previous. Delayed transfusion reactions typically occur around a week later due to rising antibody levels and destruction of the donated red cells. They can occur after twenty four hours. Patients present with symptoms of anaemia, jaundice and fevers. The treatment is supportive and repeat transfusion may be required. If this is needed it should not react with the offending antibody. In our case anti-E was found. This is another Rh antigen. This may have been prevented if the clinical team had notified the transfusion laboratory of a regular transfusion requirement and the need for extended red cell antigen phenotype in order to cross match blood more closely. As it happened our patient was eventually found to be lacking of the E antigen. For those of you who are keen to know she was D pos, C pos, e pos. All cases of delayed haemolytic transfusion reaction should be reported to SHOT (Serious Hazards of Transfusion) – an independent professionally-led transfusion scheme and to MHRA (Medicines and Healthcare produces regulatory Agency) – the legal regulatory of blood transfusion in the UK. In the future our patient may be at risk of developing further antibodies and it may be more difficult to source matched blood. Currently, however this should not be a major problem. It should be noted in a patient’s medical history that they have red cell antibodies as depending on the nature of the antibody, compatible blood may take longer to find. This is especially the case when surgery is needed. Knowing these cases in advance helps to make safe blood available. This entry was posted in Anaemia, Bone marrow failure, Laboratory morphology, Transfusion and tagged anaemia, blood transfusion, Delayed transfusion reaction, MDS. Bookmark the permalink.